Accessible Accommodation: wheelchair friendly and disabled holiday accommodation, disability friendly, mobility impaired and special needs travellers accomodation for people with disabilities, in the Gold Coast, Byron Bay, Tweed Heads, Ballina, Lismore, Kyogle area of the North Coast, NSW, Gold Coast hinterland and Northern Rivers region of Australia. If you're a "wheelie", have a mobility impairment, other disability, special needs, or are a carer looking for a break, then finding suitable holiday accommodation often presents restricted options. 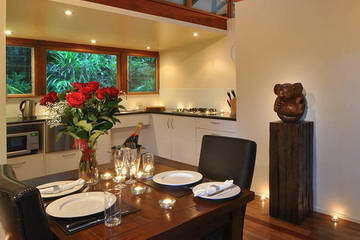 Now you can enjoy a holiday in the Northern Rivers north coast of NSW. The directory below is for holiday accomodation and short term carer respite in the Ballina, Byron Bay, Tweed Heads, Rainbow Region and Gold Coast hinterland region, where suitable wheelchair friendly, mobility impaired and disabled access holiday accommodation (not just ramp access), is available for disability impaired travellers and carers. Other facilities and services catering to the needs of disabled and specials needs travellers, maybe available, but these will vary and conditions may apply, so please check when making your enquiry. Happy holiday! Tamarind Creekside Spa Cabin is wheelchair accessible and entirely on one level, including both covered and open decks. The entire floor plan is easily navigable and wheelchair-friendly, and its plan is spacious and open. The double spa bath and kitchen also fully complies with accessibility guidelines. From AUD $375 p.n. to $655 p.n. midweek, 2 night min. Properties are shown as popular for their disabled facililites, except #. Bilinga Beach Motel is on absolute beachfront with outdoor seating and direct beach access, conveniently located just a 3-minute drive from Gold Coast Airport. Offering motel rooms, beachfront studios, family apartments with fully-equipped kitchens, and facilities for disabled guests, all accommodation has air-conditioning, a TV, and tea and coffee making facilities. Overlooking Byron Bay's Main Beach, these stylish boutique apartments and studios offer secure car parking and free WiFi. Entire unit wheelchair accessible, and upper floors accessible by lift. Some studios have a large wooden patio with private heated plunge pool and a spa bath. The original "Wheel Resort", with spacious and comfortable self-contained one b/r and 2 b/r cottages set in 16 hectares of remnant coastal rainforest. Cabins are all located on ground level, with entire unit wheelchair friendly and accessible. Bathrooms have roll in/walk in shower, and toilets with grab rails. Some also have lowered kitchens, the swimming pool has a ramp (and plastic wheelchair on request). Resort paths are suitable for wheeling, and it's also a dog friendly resort. Offering free breakfast and free WiFi, guests can relax and enjoy the garden and deck areas, and make use of the shared lounge and kitchen areas. Each room and studio includes either an ensuite bathroom or private bathroom with a shower and free toiletries. Spacious rooms with free Wi-Fi and high-definition digital/cable TV, with continental or cooked breakfasts available, and home-cooked meals in the evening. Rooms are air-conditioned and all have a private bathroom, some with a spa bath. The motel offers facilities for disabled guests. Mt Tamborine Motel is a two storey building with 12 rooms upstairs and 12 rooms downstairs. All air-conditioned rooms have a balcony. The upstairs rooms offer views over Guanaba Gorge and the downstairs rooms offer garden views. We have one room rated for Disabled Use, and also have some interconnecting rooms which are ideal for families. 38 spacious guest suites, with ensuite bathrooms, free wireless high-speed internet access, reverse cycle air-conditioning and Foxtel cable TV, with some rooms featuring a spa bath. All guest rooms are non-smoking and handicap accessible rooms are available upon request.